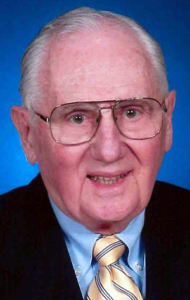 Earl A. Popp, Jr., 91, of Lancaster, passed away on Sunday, March 17, 2019. He was the husband of Margaret “Peggy” E. Diener Popp, with whom he shared 60 years of marriage this past April 5th. Born in Reading, he was the son of the late Earl Sr. and Elsie H. Henry Popp. Earl had served as the vice president of corporate communications for the Fulton Financial Corporation, retiring after 25 years in 1994. After his retirement, he worked at the Lancaster County Visitors Bureau. Prior to working for Fulton, he had worked for WHUM TV and Radio in Reading. He was a graduate of Ithaca College in Ithaca, NY. Earl was an active member of St. Peter’s Evangelical Lutheran Church, where he served as past council president and on varied committees. He volunteered at Hope House, was past chairman of Red Rose Transit Authority and a member of the Manheim Twp. Sunrise Lions Club. He was a US Army veteran of the Korean War, serving as a Staff Sgt with the Corps of Engineers. In addition to his wife, Peggy, he is survived by his daughter, Suzanne M. Sheidy of Shillington, his 5 granddaughters and 4 great grandchildren. He was preceded in death by his daughter two weeks ago, Sharon married to Michael Metzler of Manheim and by his sister, Dorris Coldren. Friends will be received on Friday, March 22, 2019 at St. Peters Evangelical Lutheran Church, 10 Delp Rd., Lancaster, PA 17601 from 1-2PM, with the Memorial Service to follow at 2PM. Interment will follow in St. Peters Lutheran Cemetery. In lieu of flowers, please make contributions in his memory to St. Peters Lutheran Church Memorial Fund at the above address. Thinking of you and praying the Lord will bless you at this hard place. The Lord is able. My sympanties to you all..